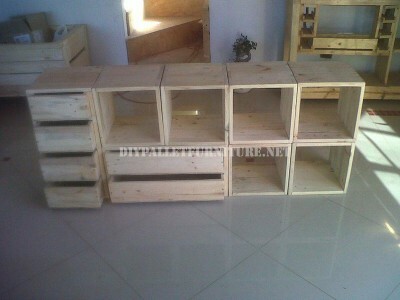 From tuespacioecologico.cl we have recieved this fantastic modular shelving built entirely with wooden pallets. Following the design of the modular shelving from IKEA, the concept consists of several separate cubes that are placed on top of each other to create a large bookcase. In addition to the standard cubes, we also can find other modules with larger sizes and drawers inside them, but always following the same dimension pattern to fit with the rest of shelves. Each module is built with planks extracted from the pallets, previously sanded and cut to the same dimensions, in order to combine them forming the cubes that you can appreciate in the pictures. As you can see the bookcase has a great potential, we can change its shape whenever we want, adjusting it to the decor of our room. It’s a very practical, nice and easy to build furniture piece, as all the cubes have the same size and you don’t need big DIY skills to build them. Finally the creators of the shelving system have painted it in a mahogany color, as you see in the picture below. Do you like this pallet shelving for the living room? 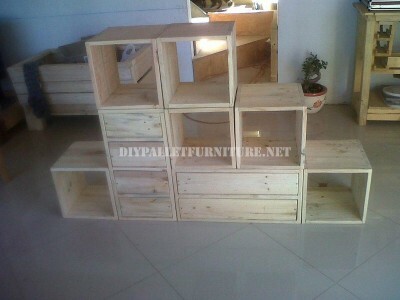 Do you want to look for more pallet shelves?